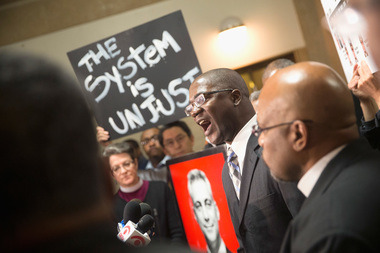 Protesters calling for Emanuel's resignation outside a mayoral press conference Dec. 1. THE LOOP — Protesters marched from Daley Plaza to the Board of Trade building Wednesday to demand resignations from Mayor Rahm Emanuel and state's attorney Anita Alvarez. Hundreds participated in the "citywide walkout" and rally that began at noon, including notable teenage protester Lamon Reccord, who was briefly detained by police shortly after condemning the killing of Laquan McDonald and police brutality. Organizers of the rally included Rousemary Vega, who has spoken out previously about school closings and Riot Fest's move to Douglas Park. She said the demonstrators organized Wednesday around one cause: getting Emanuel and Alvarez out of office. "We’re the 'City of Big Shoulders' and Rahm’s shoulders are not big enough," Vega said. "We want to show him tomorrow." Hundreds participated in the rally with the intention of "take[ing] over a street," Vega predicted Tuesday, and the group succeeded, blocking traffic at several intersections during their march south from Daley Plaza past the Board of Trade building. The organizers specifically chose noon — a time many Downtown workers leave the office anyway — to get their message more exposure, Vega said. "It's vital for everyone not just to see us on TV, but feel our presence," she said. Protesters have taken to City Hall, the Magnificent Mile, and other Downtown locales regularly since the release of a video showing a Chicago Police officer kill black teenager Laquan McDonald by shooting him 16 times. City Hall's handling of the shooting — which happened last year — has prompted a new police superintendent, a federal investigation of the police department, and more scrutiny of city leadership.